Why were there so few “clean ingredient” statements on products that should be simple and natural? Why were there no “single origin” cocoa products showcasing attributes of cocoa beans cultivated in a particular country? Why were cocoa-growing countries content to export only raw beans, allowing other countries to capture the profit sitting atop the cocoa value chain? And so, years before the terms “fair trade” or “corporate social responsibility” held any currency, our founder started a modest cocoa company named after the Ghanaian word for “paramount king.” He named the company, Omanhene. This entry was posted in newsite and tagged Beyond Fair Trade, clean ingredient, Cocoa Powder, Corporate Responsibility, Ghana, single orgin, Specialty Coffee on March 14, 2018 by Jon Wallace. There is much confusion surrounding the term “fair trade”. It can mean different things to different people with different organizations touting different certification credentials. 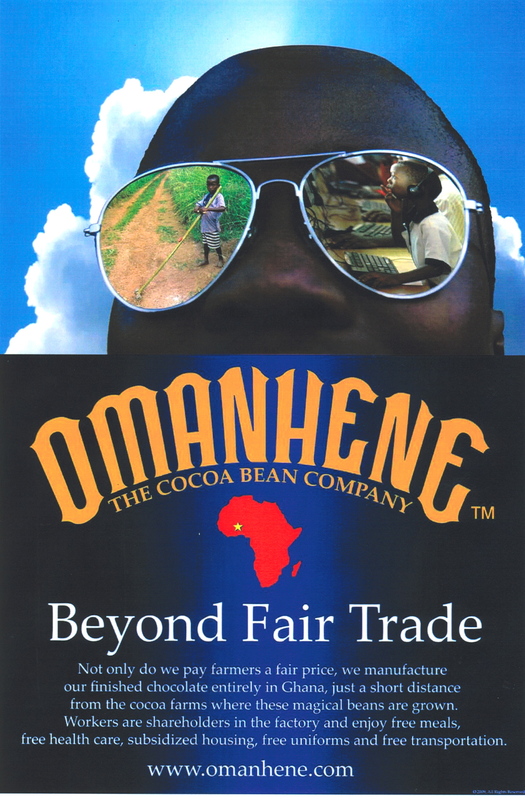 For a brief time, Omanhene was certified by perhaps the most recognized fair trade certification organization in the US. As founder of Omanhene, I’m asked, on occasion, why we no longer participate in such independent certification activities. The reasons are many; some are practical, some philosophical. Chief among them are the fact that Omanhene’s business model is, to my view, more broad and more ambitious than fair trade’s historically narrow focus on payments made to farmers — more on this below. Further, Omanhene’s work in Ghana started in 1991 — long before there were any third-party fair trade protocols so our focus was on long-term viability of a path-breaking business model. The Omanhene Vision: To create a true and authentic world-class culinary culture that showcases the natural resources and human talent of Africa. I founded Omanhene based upon my experience living in Ghana as a 16 year old exchange student. My success depended on my acquisition of cross-cultural skills — skills which placed a premium on my ability to adapt to my new surroundings. It was this formative experience that lead me to place a premium on listening, observing and learning — adapting to indigenous cultures, economies and political realities rather than trying to change them. My predilection for adapting to local conditions leads to my philosophical disagreement with certain of the third-party certifications organizations. Perhaps the most recognized fair trade certification agency requires purchases of cocoa beans exclusively from farmer cooperatives — an organizational form that is not indigenous to Ghana. Ghana is home to over 600,000 small, family-owned cocoa farms, most of which are about 2 acres in size. The overwhelming majority (over 90 percent, by our own estimation) of these family-owned cocoa farms in Ghana are not members of any sort of cooperative. Compelling these farmers to join a cooperative promoted by offshore organizations with their own economic interest in promoting cooperatives smacks of paternalism and seems more than a bit unfair to independent farmers who prefer not to join a cooperative. Mandating membership in a cooperative seems anathema to all I learned as an exchange student where it was incumbent on me to adapt to Ghanaian culture and not vice-versa. Also, the audit procedure of the most recognized certification agencies is narrow; it focuses on the price paid to farmer cooperatives and does not directly address other important issues such as environmental sustainability, value-added manufacture in-country, child labor issues, and corruption. While the price paid to farmers is certainly important, it is an unfortunate fact that raw cocoa beans occupy the lowest rung on the cocoa value chain. Omanhene was founded specifically to give Ghana a chance to benefit from revenues derived from high-value chain endeavors such as the manufacturing of gourmet chocolate and cocoa products and the potential to own a share in branded products. I focused on high-value activities because at the end of the day, paying premiums that are worth pennies a pound won’t transform a developing economy. The “fair trade” price paid to a cooperative amounts to a unilateral subsidy rather than a pure market-based premium based on quality, for example; therefore, it is not at all certain that such a subsidy is sustainable over time. Indeed, the number of fair trade tons of raw cocoa sold through the fair trade system by the single certified cooperative located in Ghana is extraordinarily small compared to the total tons of cocoa grown in the country and even small compared to the total tons grown by the cooperative itself — reports are that well under 10 percent of the cooperative’s total cocoa output actually is sold through the fair trade system while over 90 percent is sold through the pre-existing Ghana government system which guarantees a minimum price to farmers and distributes a bonus to farmers if world prices substantially exceed the Government’s promised price. Due to this pre-existing price guarantee system administered by the Government of Ghana, the need for another subsidized fair trade price regime is redundant in Ghana. Any pricing system based on a unilateral subsidy really rests upon the charitable intent of the buyer to pay a premium. My own view is that such charitable intent may not be sustainable long-term and it reinforces the perception that countries in the developing world need charity rather than equal opportunity — again the spectre of paternalism encroaches. Such subsidy programs inherently beg the question of how much of the premium goes to the farmer cooperatives and how much goes to the administrative costs of running the certifying organization. Omanhene believes that the success of its endeavor rests upon offering a high-quality product at a market-sustainable price. While we find great joy in helping the communities in which we work and live and derive much satisfaction from the transformational results of our business model, Omanhene is not a charity. Our business model is chiefly concerned with adding significant value locally by manufacturing locally — an unprecedented and very difficult endeavor in the developing world, and this focus on processing cocoa beans is the only way to really increase incomes throughout the entire cocoa value chain. We rely on the democratically elected Government of Ghana to unilaterally set the price we ultimately pay for our cocoa beans. There is no “negotiation” or discussion. The Government sets the price that it feels is in the best interests of its cocoa farmers and that is what is paid. Interestingly, this price almost always exceeds the “world price” by a significant margin and has, I believe, exceeded the “fair trade” strike price on several occasions. Ghana’s high quality cocoa has, for decades (well prior to any fair trade regime), earned a premium on the world market simply because it is of such high quality — so there is a market-based, economic reason why, at least in Ghana, an artificial fair trade subsidy price is superfluous. Further, by manufacturing in-country, we significantly reduce the carbon footprint imposed by chocolate manufacturers who have to ship raw beans abroad for processing. This environmental impact is not audited as part of certification regimes which look only at fees paid to farmer cooperatives. Instead, we support and participate in the United Nations Global Compact; we believe its ten principles address a broader array of issues than most fair trade audit procedures (ie., the Global Compact addresses human rights including fair labor standards, environmental sustainability and anti-corruption). To download Omanhene’s most recent UN Global Compact Communication of Progress (COP), click here. The fair trade issue is a complicated and nuanced one. I characterize Omanhene’s efforts in Ghana as “beyond fair trade” since we are concerned with the entire value chain, not just the initial transaction involving payments to farmers. At the end of the day, there are many paths to creating a more just and peaceful world and I support all efforts to improve the human condition. This entry was posted in Press releases, Steve's Blog and tagged afs, Beyond Fair Trade, Family Farm, Ghana, Global Compact, Sustainability, Value Chain on March 10, 2018 by Jon Wallace. The word “Omanhene” comes from the Twi language in Ghana. Twi is the language spoken by the majority of the Akan people who live in the middle of the country. The traditional capital of the Akan is the city of Kumasi. In Ghana, the local chief is the traditional authority at the village level. As you move up the hierarchy, there are regional chiefs, provincial chiefs and at the very top of the line of authority sits (literally sits upon a royal stool) the “Omanhene” or paramount chief or king. The term is an honorific title bestowed upon the paramount king who, to this day, remains a potent symbol of moral and ethical authority in Ghana. This entry was posted in Press releases and tagged Ghana, Omanhene Stories, Twi on March 10, 2018 by Jon Wallace.